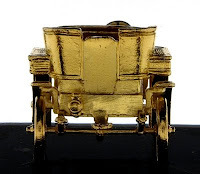 This Sarome table lighter is probably the best example of a fine imitation of the Ronson Crown. It has even a better construction than the original. The Sarome wick lighter was manufactured between 1953 and 1954 in Japan. Sarome Co., Ltd. was founded in March 1940 by Kunijiro Segawa in Tokyo, Japan and it was specializing mainly in manufacturing toys. The first cigarette lighters were manufactured in February 1952. Since 1955 butane gas lighters were added to the company's portfolio. The Sarome company still exist and is well known for its high quality luxury cigarette lighters. The base of the lighter as well the lighter insert are chrome plate. The lighter insert, in opposite to the Ronson Crown, is removable which makes it more user friendly regarding its maintenance. A very good quality of craftsmanship in terms of quality. Not many of these lighters were made which makes them a very rare find. It is worth to know that SAROME means 'god of flames'. The bottom of the base is padded with green felt. 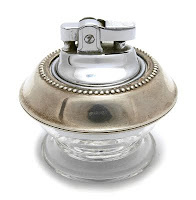 This table lighter is fine example of Art Deco style and was manufactured by Fisher Silversmith Inc. in 1954 in Jersey City (New Jersey, United States). The company prospered from 1936 to the 1970s. 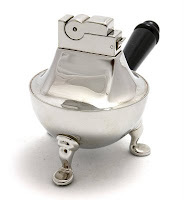 It manufactured sterling and silver-plated flatware and hollowware, mainly in modern design like Art Deco. 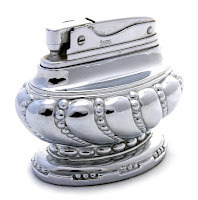 The base of the lighter is made of sterling silver – 925 grade of silver. It is weighted and marked. The lighter is prism-shaped and has a irregular hexahedron base. The lighter insert was provided by Evans (USA). 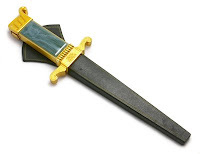 It is made of brass and is silver electroplate. The release is shell-shaped (conchiform). The Ronson Empress (Onyx) was manufactured in England between 1964 and 1969. 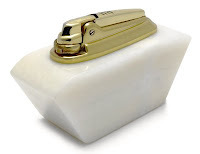 This table lighter was made in white (see picture) and green onyx. The removable lighter insert – the Varaflame – is gold-color-plated and has a fingertip flame control. The lighter insert is fastened to the base with a black plastic screw. 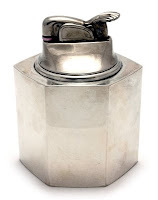 The United Automobile table lighter was manufactured between 1955 and 1956 in the United States by United Findings Co Inc. This wick lighter is a typical example of the industrial use of the clear float technology (based on the idea of inclusion) which was very popular in the 1950s in the U.S. The base of the lighter is made of clear float lucite which is a transparent thermoplastic commonly known as plexiglas. 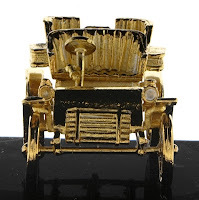 Within the lucite is a small metal model depicting the 1902–03 Cadillac Runabout with Tonneau which also reminds the 1903 Ford Model A (the first car produced by Ford Motor Company). This should not be a surprise as Henry Ford was the chief engineer at Cadillac till 1903. The base is padded with four small rounded felt pads. 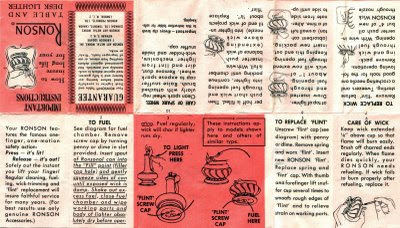 Below a scan of the Ronson Tempo instruction on "How to use and care for your Ronson table lighter" from the year 1955. Click on it to see the details. This instruction applies not only for Ronson lighters but for most table lighters available on the market whatever the brand is. Hint: When you try to replace flint in your lighter which was not used for a longer time - this often implies vintage cigarette lighters - you will probably need to find out if the earlier flint did not got frozen (stuck). When you noticed that the flint dissolved it is vital to crush it carefully with (for instance) a small screwdriver. Sometimes you will need to take off the top in order to have a better access to the flint. The Ronson Varaflame Brushed Alu was manufactured only in England in ca. 1966. The surface of the base of the lighter has a mottled brushed pattern which was used among others on the top of the Ronson trays (look Queen Anne Set). The color of the base is cream pearl. 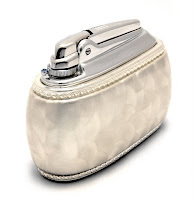 The removable lighter insert – the Varaflame – is chrome-plated and has a fingertip flame control decorated with a light blue Swarovski crystal. The base is padded with black felt. The lighter insert is fastened to the base with a black plastic screw. 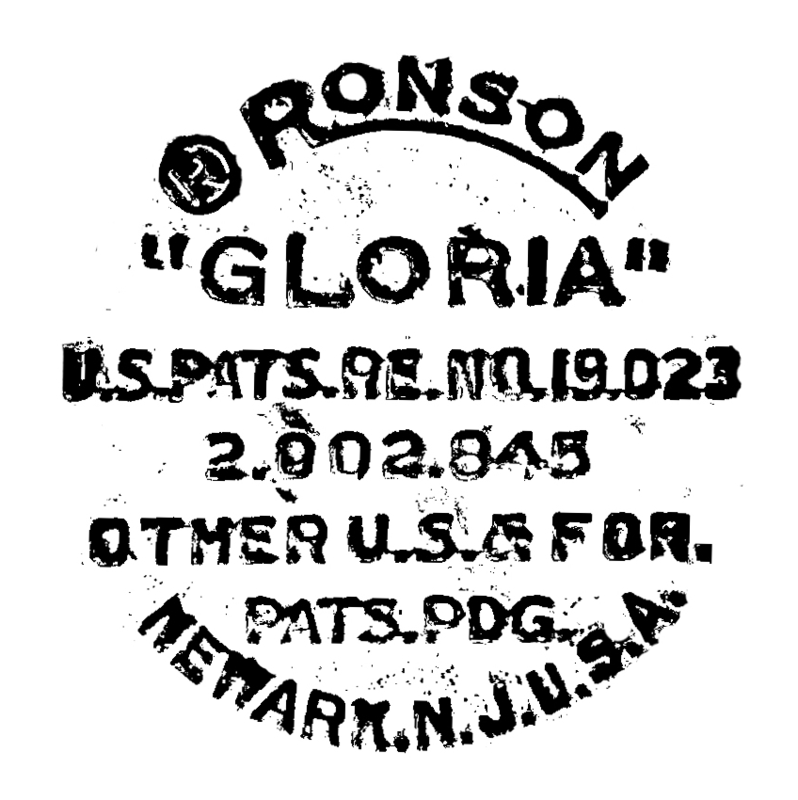 The Ronson Gloria was first manufactured in 1952. The production went on till 1954 in Newark (USA). It is heavy silver-plated (partly polished and satin) and uses the same lighter fitment as the Ronson Juno, Leblanc Clarinet Bell and Ronson Penciliter. The lighter insert is removable. The pattern used at the bottom of the base is very similar to that used in the Ronson Queen Anne which makes the cigarette urn of the Queen Anne also a good match. The base is padded with cork. The silver plate is protected by a transparent lacquer. 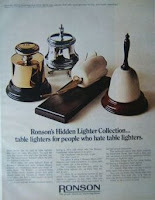 This Ronson Varaflame Empire is one of the four table lighters from the "Ronson's Hidden Lighter Collection". They were advertised as: "table lighters for people who hate table lighters". This heavy lighter was introduced into the American market in 1964. The production ceased short after that in 1969. It was probably manufactured only in Woodbrigde (New Jersey) in United States. It was not a bestseller which makes this lighter rather uncommon. This Ronson has a light (made mainly from plastic) Varaflame fitment which has a fingertip flame adjustment. 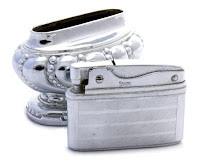 The top of the lighter insert has a metal cover which was available silver plated or chrome plated. The top (the lighter insert is mounted there) and the base of the lighter is quite heavy as they are casted from metal and heavy silver-plated. The base is three legged and padded with green felt. Overall a nice, "distinguished" and timeless collectors' lighter. The "Heritage" Set was manufactured between 1949 and 1953 by the American Safety Razor Co in the United States (Brooklyn, New York). 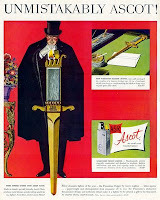 The set consists of a lighter, cigarette holder and a tray. It was available in gleaming copper and rhodium finish or solid brass. A very original set due to its unusual design and the black bakelite handles. The tray is unmarked. It is relatively light and engraved with different flourish patterns. One of the advertisement published in the Times in 1950 says about this set: "Decorators say it's the last word in table touches for living room, library or den! This magnificent A.S.R. 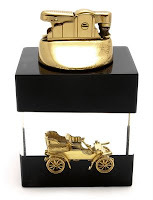 'Heritage' Table Lighter is at home in any setting, traditional or modern. And what a wonderfully different lighter it is! No other like it. Only the 'Heritage' has a handle! You can actually serve a light!"